If you’re prepared to welcome email marketing as your #no.1 marketing then I have a checklist for you, after all, you never accord your email I.D to any stranger asking for then how can you expect the same from our customers. There is no meaning of Email Marketing for your company if you don’t have potential subscribers and their emails with you. Because email marketing needs Emails, Right? Give your customers a reason to give their email I.D to you. Attach a short and sweet subscribing page at your home page, your blogs, Facebook page or anywhere you think your customers a thriving. You can even ask for their name and birth-date so as to provide some special offers, but don’t make it too concussed, because over congested forms can also be a reason for your customers to move to another window. So start growing your email subscriber list but in a right manner. A weekly newsletter, Your sales updates, your CEO letter or your offers anything it would be, just tell your customers. Be as clear as possible for your motto to grab their email IDs. It’s good to have short subscribers list rather than going to the spam box. Always send a welcome email to the person who have subscribed for you. It’s also good if you ask them for their surety of subscription in your welcome email showing content about your products and services. You can also give your subscribers offers and gift vouchers as a way to thanks them for their co-operation. Believe it or not, your Newsletter reflects your brand. So your every email campaign should match your brand theme as this will make your subscribers feel more familiar to. Including your brand theme colour and your brand logo and little creativeness in your newsletter can make them which will actually get read by your subscribers. Your customers a really busy and they receive a lot of emails daily, so what’s so special about you that they would, crossing all those emails reach to you and open your email. Use a compelling subject line and break your blogs into parts because nobody like to read a long paragraph. Make your emails scannable by adding images and broken paragraphs so that it won’t t ask more than two minutes to understand your whole email. Make your Newsletter Your Commitment! Make your Newsletter a routine process. If you’ve acquired subscription on the basis of your daily newsletter, then it’s not only a newsletter anymore it’s a commitment. If you leave your subscribers inbox abandon for a month and then appear surprisingly, then would get nothing more than a deletion or even worse, a spam box. So maintain a complete calendar of our email newsletters. Even the editors need a re-editing before you throw your emails revise it once again, the importance of grammar and styles is the same in emails as you feel in websites and blogs. Coming to Test, yes test your email before it gets too late, different emails in different devices get opened differently. So never forget to send the test emails . You can even get associated with some of the email service provider companies to test your email before you shoot it. #8. Make Your Email Mobile Responsive. It is very very important to make your emails Mobile responsive. If your email is not getting opened in mobile devices correctly then you’re next to the extinct. So before you throw out your campaign make sure whatever you’re sending it should be Mobile friendly. Stop being an accidental spammer. Check out the Can-spam Act to revise your spam rules. Remember that you are meant to send emails to people you have subscribed to you and not anyone. Always provide an easy approach to unsubscribe your email if your customer doesn’t want them more. It’s good to get unsubscribed rather than getting spammed. So, here was your checklist. Start from the start and end it completely. 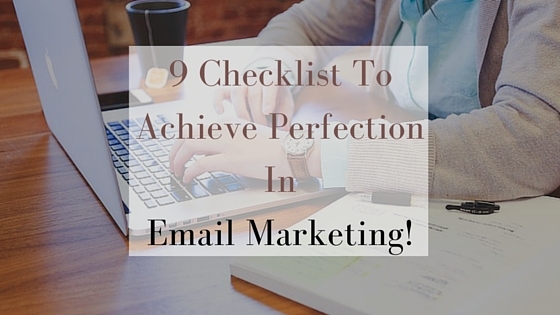 Make your emails a perfect marketing strategy for your company. If you have some more tips to make your emails more expressive do share with us. We are email lovers and would love to grab something new about it. Recommended: 10 Amazing Tips to Increase Your Email Open Rates!